Thanksgiving is almost here and that means everyone and their mother (literally) is working on planning what to make for the big dinner. I finally got myself together and planned our dinner (we're hosting this year) and I kept it pretty simple - just the classics. One of my favorite dishes every Thanksgiving? Sweet potato casserole. I've pretty much never met a sweet potato casserole I didn't like but I prefer mine to be slightly sweet and marshmallow free. These little casseroles are just that - slightly sweet (with NO sugar since I'm nixing sugar right now) and not a marshmallow in sight. 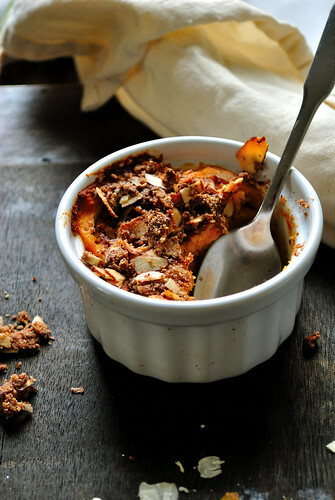 Instead, they are topped with a coconut and almond streusel that I may or may not have eaten several spoonfuls of on it's own. 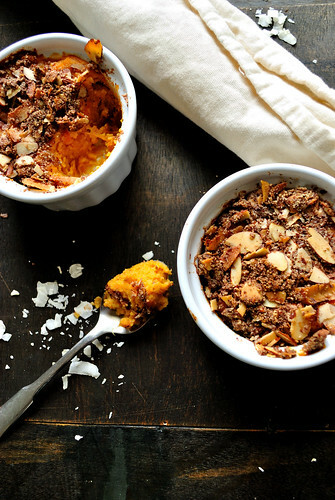 Sweet potatoes + almond + coconut = serious Thanksgiving bliss.